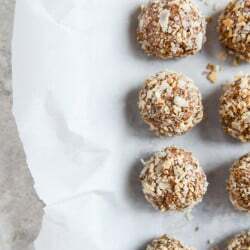 No-Bake Almond Joy Snack Bites. My world is currently revolving around snacks. And you can bet that I can turn anything into a snack. Justify all things into a satisfying, somewhat nutritious snack. Kind of like how when I was pregnant and had zero appetite, I justified pizza as the best and most nutrient-packed, complete meal I could eat since it had bread and cheese and basically carbs, fat and protein (add bacon, duh). I mean, it did really make sense because I wanted to go the entire day without eating anything, so having a few slices of dairy and dough was, like, the smartest decision at the time. So needless to say, before the baby came I was PREPARED with snacks. I loaded up on a bunch of granola bars and apples and peanut butter and sliced almonds and cheese and made like four batches of snack mix in a month, because it has the word “snack” in it and therefore works. AND. I also made some of these balls. Well, first I made these other balls. The peanut butter ones that I shared years ago – that are a staple of a snack in this house. Because they are super easy to prep and taste delicious when refrigerated and just… satisfy you. And you can make them fasssst. Which is imperative these days. Make fast snacks, eat fast snacks. Story of my life. I had wanted to make another version of those snack bites for awhile but nothing seemed quite as perfect as the peanut butter (and a little chocolate) combo. Mostly because nothing is as perfect as peanut butter and chocolate. Yes yes, why of course. These are packed with good-for-you things like oats and flaxseed and chia seeds. They make you feel excellent, don’t promote self-hatred and keep you full when you’re waiting on lunch or dinner or second lunch or second dinner. Make a big batch, shove them in the fridge or freezer and you’re good to go! Eat all the snacks. For me. In a large bowl, stir together the oat bran, flax, almond flour, coconut, almonds, chocolate chips, chia seeds and salt. In a small saucepan, combine the almond butter, honey, coconut oil, butter and vanilla extract over low heat. Stir until it is completely melted and smooth. Add the almond butter mixture to the dry ingredients, stirring well until the mixture is moistened and a wet dough forms. Shape the dough into balls that are around 1 inch in diameter. Roll each ball in the coconut/almond crumb coating until covered. I like these best when they are stored in the fridge! Add the coconut and almonds to a food processor and pulse until they turn into small crumbs. *and maybe rum. you could add a drop of rum. wait what? 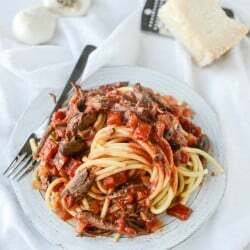 Slow Cooker Short Rib Sauce with Bucatini. I absolutely love these – I have made them many times and every single time they are a huge hit. I do not add the coconut butter and I do not replace it with anything, and they come out perfectly. I like using crunchy almond butter for extra texture too. Thank you for the recipe! Nice! Cool change of pace to have a healthy bite recipe that’s made on the stove and by hand-mixing instead of in a food processor. These were good, but I had a really hard time rolling them together despite following the recipe as written. I even tried wetting my hands a bit to see if that would help but it didn’t :/ I think it needed more of the wet mixture! Once I did have them rolled, they would have been impossible to eat had I not put them in the fridge (I think the cooled coconut oil helped solidify them). They were fine once refrigerated, but I’d just make sure you’d give yourself some time to stick them in the fridge (ie. make at least a few hours in advance).